The largest bag in the range, the MBAG120PN is padded to protect your equipment and has the following features: Asymmetric tapered shape allows you to store the tripod with the head attached. Tripod legs fit comfortably in the narrower end (diameter 20cm) and extra space is allowed for the larger volume of the head at the wider end (diameter 23cm). Zip extends down the length of the bag, but also fully opens the top end of the bag. Thermoform padding holds the tripod in place in the bag and protects it, especially the head, during transport. 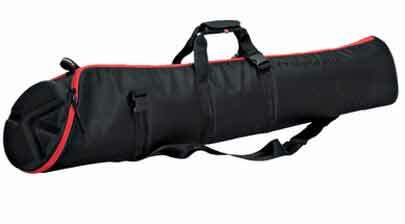 Inner pocket holds accessories (such as video head pan bars) Innovative design and style; ballistic nylon, zips and other materials used are of top quality Can be hand-carried horizontally by the side handle, vertically by the end handle (also useful for storage), or shoulder-carried using the included strap.